The bluish-black Pipevine Swallowtail, with its fearsome-looking caterpillar, was first reported in Massachusetts by Thaddeus W. Harris, who reared specimens in 1840 from larvae found in the Harvard Botanic Garden in Cambridge on a Dutchman’s Pipe vine. Two broods of caterpillars were found at that time, only one of which was reared, since the other had been destroyed by the gardener. This event occurred in late summer; an adult had also been caught in Watertown earlier that summer. It was thought at the time that the eggs had been laid by some strays from the New Haven, Connecticut, area, where, as Scudder put it, the Pipevine Swallowtail was known to be “not very uncommon.” By 1889 the species had been reported for several other Massachusetts locations, including Boston, Beverly (“found nearly every year”), and “on the Watertown side of Mt. Auburn” in Cambridge in 1869 (Scudder 1889:1246). Pipevine Swallowtail was thus well known to Harris and Scudder as an irregular immigrant into Massachusetts. The species had been described and named by Linnaeus as early as 1771 from a specimen in the Drury collection which is now probably lost, and was listed by Forster in 1771 (Miller and Brown 1981:60; Calhoun 2010). John Abbot subsequently figured the species from another specimen, and it appeared in Smith and Abbot, Lepidopterous Insects of Georgia, 1797. A specimen was also in the collection of the Philadelphia naturalist Thomas Say, who described it in American Entomology Vol. 1, 1817/1824, an article to which Harris refers. In the late 1800’s it became common to plant the ornamental vine Dutchman’s Pipe (Aristolochia macrophylla, =durior) as a shade screen for large Victorian porches. A. macrophylla is Pipevine Swallowtail's main native host plant in our area; the plant was originally found only in southwest Pennsylvania and West Virginia south, in open woods and stream banks, but cultivation has extended its range northward. The only other native host in eastern United States, Virginia snakeroot Aristolochia serpentaria, is less common in the northeast; it was known to be growing wild in Connecticut in 1860s, but was not common even then. A photograph of egg-laying by Pipevine Swallowtail on Dutchman's Pipe in Massachusetts (July 16, 2013, Paxton, E. Barry yard; photo by G. Kessler) may be seen at http://garrykessler.zenfolio.com/p232585382/h6015b4ae#h6015b4ae. Pipevine Swallowtail eggs laid on this occasion may be seen here. The extension of A. durior ‘s range by human gardeners in the 1800's made possible a seasonal range extension for the associated butterfly, Pipevine Swallowtail, into Massachusetts (Table 1). (This interesting dynamic, of human agriculture extending the range of an insect, has played out in other cases as well, for example, in the cultivation of hops and clover.) In October 1894, Miss Caroline G. Soule, a well-known butterfly enthusiast, reported to the entomological journal Psyche that "Papilio philenor was found for the first time on Aristolochia in Nonquitt, Mass. in August. It is the first time I have seen these larvae or butterflies in Massachusetts (Soule 1894)." Nonquitt is on the coast just south of New Bedford. And the year 1896 apparently saw a good influx of Pipevine Swallowtail into eastern Massachusetts: that July F. H. Sprague collected three in Wollaston, and C. Bullard collected two in Cambridge (specimens in MCZ). However, Sprague’s six May and June 1897 specimens from Wollaston were probably raised from 1896 larvae. In the early 20th century porch plantings of A. durior were still common, and there were a good many reports of Pipevine Swallowtail around the greater Boston area and in Essex County. By 1934 adults had been reported from Saugus, Manchester-by-the-Sea, Melrose, Winthrop, Medford, Stoneham, Lawrence (specimen in the MCZ), and Wakefield- --as well as in the Worcester area (Forbes) and Westfield (from the Gypsy Moth Lab there). Occasionally the larvae were present in large enough numbers to “seriously defoliate plants” (Farquhar, 1934). Yale Peabody Museum has a specimen collected in Sherborn, Massachusetts 12 June 1932, by E. J. Smith. Charles Kimball reported individuals found on Nantucket in 1934, 1937, and 1939, and F. M. Jones reported the swallowtail's arrival on Martha's Vineyard "from time to time," where it reproduced on its host vine sometimes for "several successive years," but did not persist as a permanent resident (Jones and Kimball 1943). But in the 1980’s reports became more frequent. Combining Atlas and Lepidopterists’ Society data, the numbers reported were 4 in 1986, 6 in 1987, 2 in 1988, and 1 in 1989 (MAS Atlas; LSSS 1987). Over the five-year 1986-90 Atlas, Pipevine was confirmed in only 12 out of 723 blocks, and was termed “rare” in the state. Fifteen years later, MBC data 2000-2007 rank it as "Uncommon to Rare" (Table 5) in terms of numbers seen. Pipevine Swallowtail may be more common today than at the turn of the century. Since 1992 at least a few have been seen nearly every year, and there are three years -- 2007, 2011 and 2012 -- with double-digit sightings (Chart 1). The overall 21-year trend seen in Chart 1 is upward (though communication, reporting and raising effort has also increased over this time). In some years (2007 and 2010) at least four known specimens were taken (see list under Distribution); these individuals are still shown on the chart. These data make the case for designating the Pipevine as not simply an “occasional” or “erratic” immigrant, but a “regularly occurring” arrival. But it is still not resident, because it does not over-winter as far as we know. 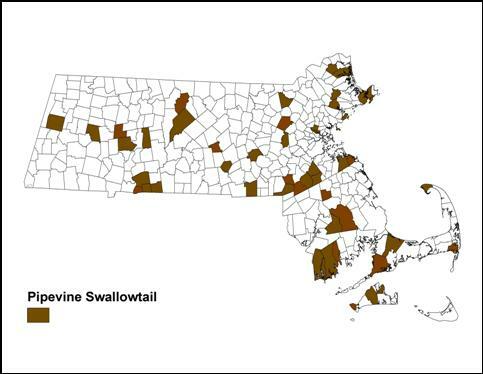 A Pipevine Swallowtail could show up almost anywhere in Massachusetts. Map 1 shows the 47 towns for which there was at least one recorded sighting 1992-2013. Berkshire County is the least likely locale for this species: there is only one report, from the 2007 NABA Count in Pittsfield. The next nearest known sighting is to the east, in Worthington, in 2010. The northwest and southwest corners of the state produced no reports during this time period. Pipevines are usually seen as dispersing singles, but numbers may build up around favored breeding sites. The most frequent reports and individuals in these years were from south Dartmouth (Allens Pond area) and Northampton community gardens; the latter had late-lingering individuals in 1999, 2000, 2003, 2007, and 2011. The 1986-90 MAS Atlas included reports from, notably, Great Barrington in the west and Penikese Island and Thompson's Island in the east; there were also 1986-88 Atlas sightings in the towns of Carver, Marion, Marshfield, Medfield, Middleboro, Mt. Tom (Easthampton), and Sterling. Included on the map are Lepidopterists' Society reports of specimens taken in Longmeadow (Fannie Stebbins WMA, 14-Aug-07), Concord (19-Sept-07), Westport (Gooseberry Neck, 24-Sept-07), and Oak Bluffs (23-July-10)--- all by M. Arey (LSSS 2007; 2010). There are no reports from Nantucket in these years, but several from Martha's Vineyard. In early July 2011 larvae were found on a Dutchman's Pipe vine in Aquinnah on Martha's Vineyard, from whence some were transported to Polly Hill Arboretum in West Tisbury. It is possible that the Aquinnah larvae were from an adult which successfully over-wintered, since one had been seen there in fall 2010, but it is also quite possible that they were from a 2011 immigrant adult. Jones and Kimball (1943) had described Pipevine as a fairly regular visitor to Martha's Vineyard, and suggested that some may have persisted through several winters. There is as yet no positive proof that Pipevines are becoming a resident species on the island, but Matt Pelikan writes that it would not surprise him if they managed to do so (masslep post 7/7/2011). Adults often arrive in early summer, producing caterpillars and chrysalis' during July and August. For example, in 2013 a female Pipevine Swallowtail arrived on July 15 in the yard of Elise and Karl Barry in Paxton, laid eggs on Dutchman's Pipe on July 15 and 16. Larvae were raised on a open porch and adults began emerging from chrysalis on August 26 (see photo links above under Host Plants). These second-brood adults probably did not survive the winter. Some chrysalises, however, did not eclose, but were over-wintered. In a similar well-documented instance in 2010, a Pipevine arrived and oviposited on July 29 in the yard of Betsy Higgins in Northampton (Florence). Caterpillars were raised inside, the chrysalises all eclosed September 11-14, and the butterflies were released (Higgins 2010; see photo above). In 1999 and again in 2004 caterpillars flourished in the yard of Richard and Robin Gross in Lakeville, producing late summer adults. In the cases where chrysalids do not eclose in August or September, they may survive the winter in Massachusetts if kept in a sheltered location, particularly in warmer areas. For example, in 2011 Madeline Champagne in Foxboro successfully over-wintered 10 Pipevine chrysalids in a roofed and partly sunny area next to her house. They emerged in May 2012. (M. Champagne, pers. comm 10/14/2013). Overwintering in an unheated basement has been successful in Wrentham, and in Paxton in 2013 Elise Barry overwintered three chrysalises in an unheated attached garage; two emerged on June 2, 2014, at a time when her pipevine plant was showing new leaves. But in Athol, in northern Massachusetts at a high-elevation, chrysalids which were left outside in 2011 apparently did not survive the winter (D. Small, pers. comm. 10/12/2013). Earliest sightings. In the 22 years of BOM-MBC records 1992-2013, the three earliest "first sightings" of adults are 5/18/2012 Foxboro, M. Champagne (possibly from over-wintered stock); 5/27/1999 Provincetown, K. Gentalen, and 5/28/2011 Wayland, M. Arey. 2012: 5/18 Foxboro, 5/19 West Bridgewater, 6/30 Foxboro. But in all other years, the first sightings were not until July. The MBC flight chart shows that the majority of 1993-2008 sightings fell between July and the first week in October (http://www.naba.org/chapters/nabambc/flight-dates-chart.asp). Latest sightings. In same 22 years of BOM-MBC records, the three latest "last sightings" of adults are 10/16/2011 Gloucester Eastern Point J. Hoye, photo; 10/9/2010 Aquinnah, P. Gilmore and L. McDowell, and Dartmouth, S. Moore; and 10/8/2007 Northampton, B. Spencer, photo. 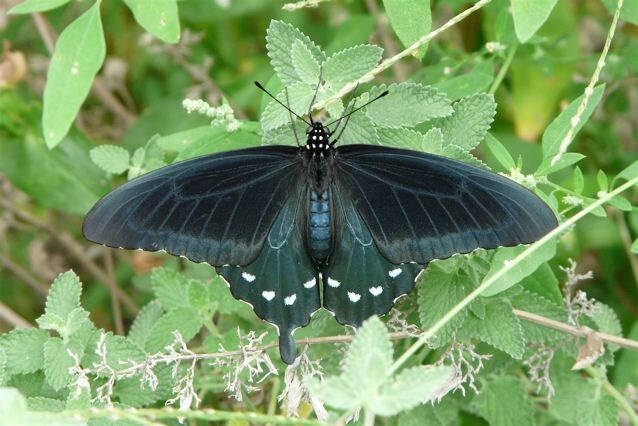 In Connecticut, Pipevine Swallowtail was until recently believed to be only an occasional, non-hardy immigrant, but by 2007 the Connecticut Atlas suggested that the species had become "an over-wintering resident” (O’Donnell et al. 2007: 128). Fresh individuals have been seen every year since 2002, and in 2003 a new location for A. serpentaria inland near the Eightmile River was found, with fresh Pipevines flying nearby (Stichter 2004). If Battus philenor over-winters unaided in Connecticut, it may soon do so Massachusetts. Urbanization and road-building on the one hand, and re-growth of dense forests on the other, may both negatively impact this species. Larvae are susceptible to pesticides. Numbers found during the 1995-99 Connecticut Atlas suggest some decline there, with 52 pre-project reports compared to 11 project reports, and some pullback from the extreme southwest coast near New York City (O’Donnell et al. 2007: 128). In New Jersey, Gochfeld and Burger believed that it had declined since the turn of the century, since “it is known from fewer localities, despite the increased number of observers” (1997: 33, 119-120). However, this is a resilient and adaptable species, and if the host plant is provided it may begin to increase due to climate warming. List-length analysis of MBC data 1992-2010 showed a 55.8% increase in sightings in this state, although the result had a wide statistical margin of error due to the small number of reports and the necessary omission of single-species reports (G. Breed et al. 2012). Thus, a warming New England climate may already be positively impacting this southern-based species (Table 6). If there is a resurgence in the planting of its host plant, more broods of Pipevine Swallowtail caterpillars will be found here, and the species may eventually successfully over-winter if climate warms significantly. The species is at home in garden environments, and will reproduce in those situations, having up to 3 broods in one Virginia garden (H. Pavulaan,, pers comm.. 9/18/04).